When a new baby arrived, this family reconfigured the home to make room for the new bundle of joy. 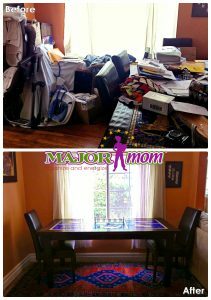 The office became a nursery, and the dining room became the office—which in turn became the dumping ground for baby gear, piles of mail and just about every other odd or end that no longer had a designated place in the house. The dining room was no longer functional, so the family resorted to eating meals on the couch in the living room. They were so embarrassed by the state of their home that they avoided inviting anyone over. Their home began to stress them out and was no longer a comforting haven at the end of the day. The family knew it needed to change, but they didn’t know where to begin. They finally reached out to Major Organizers for help. First, our Liberator assessed what the family needed. Adding a small desk to the living room solved the office dilemma. Then, the Liberator helped the family find storage solutions for the baby items and other clutter that had buried the dining room. In the end, the dining room was transformed back into what it was meant to be all along: a space for the family to come together each day and break bread. Now, the family is no longer ashamed to have guests walk into their home. They went from having a home they didn’t love living in to a home they love returning to at the end of each day.